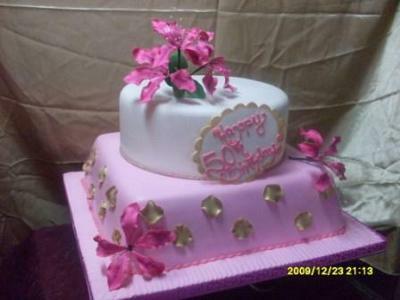 This 50th birthday cake is a round shape on a square base decorated with rose pink lily sugar flowers and gold petals. Gorgeous!!!!!! Fantastic! That is sooooooo beautiful! Join in and write your own page! It's easy to do. How? Simply click here to return to 50th Birthday Cake.